5-19-16: Hey all! Just wanted to let you all know I need to push the next update ’til next Tuesday, I’m taking an extended rest post-TCAF because my body was not doing nice things to me up in Canada and I’m trying to get it to calm down so I can actually concentrate on work. Sorry for the delay! Things have been hectic as heck cuz I’ve been prepping for TCAF! I’ll be there this weekend at table Q5 with my friend Leigh Davis! I’ll have books and stickers and I’ll be debuting this monster gal book! Stop on by!! Sorry for all the delays, once I’m back from TCAF updates’ll resume on the 20th! I let out the most squeakiest of noises. Glenn is too precious. Shopkeeper lady looks like Jane Crocker! I had to go back, but yeah, they totally do! If there’s one alternate, why not two? But you couldn’t know about that, could you? Blaust I’ve run out of material. Aw well, can’t wait to get more of this, haven’t been this invested in a comic since Homestuck was updating. I appreciate the unique fantasy setting, so many people take the boring rout and just copy Tolkian. ….Is that Osomatsu and Jyushimatsu in the last panel? Hi oso, hi jyushi. Fancy seeing you two here. Guess you guys had to go somewhere during the hiatus. Saw your guest comic on Cucumber Quest. Spent 2 days catching up on this. Totally worth it, looking forwards to following this series in the future. 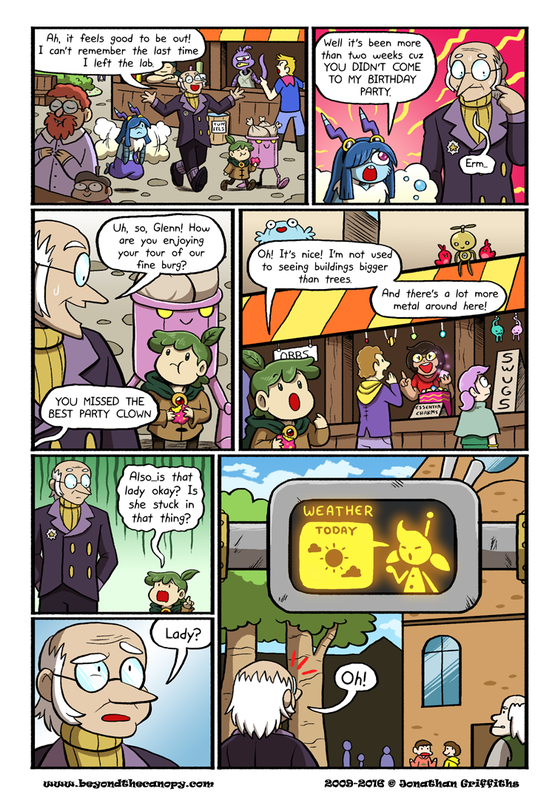 The Shopkeeper in the upper left-hand corner of the first panel looks just like a Snorlax. Hey I just found your comic! I love the timing and the art is your art is very choice. Now I have a lot of story to catch up on.